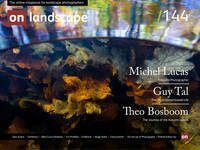 Michel is a passionate Dutch landscape photographer, inspired by wild nature. His images have been published internationally and awarded in national and international competitions. He likes to share his passion and inspire others during workshops for small groups. Michel Lucas, a biologist by training, is inspired by landscapes that are largely free of human influence. Most of his images are made in two areas: his local patch ‘Hatertse Vennen’ (the Netherlands) and the ‘High Moors’ (Belgium). He published his first book ‘Hoge Venen’ (High Moors, wide and intimate landscapes) in 2016. From early childhood on I have always been interested in nature. So there was never any doubt about the choice of study: biology it would be. I had romantic ideas about a job in wildlife research, but as job perspectives were uncertain I turned towards a job in environmental monitoring. I picked up cameras at several stages of my life, but I was never really serious about it. This changed when I joined my local nature photography club in 2004 after a trip to the Galapagos Islands and the rainforests of Ecuador. At this club I became aware there was much more to photography than filling the frame with rare birds or animals. Here I also met and became friends with Theo Bosboom, whom I think of as one of the great nature photographers of our time. So this club and friendship got me on the track of being a passionate nature photographer. At this moment, I have a regular job to pay the bills and photography is for leisure and fun. As I am always ambitious to develop myself, I try to further my photography by publishing (a book and articles), participating in competitions, and giving lectures and workshops. I am undecided about turning pro. Of course, I find the idea appealing at times but I value my freedom and I am not looking for increased stress in having to make money from photography. Right now, my strategy is one of gradual development, building up, learning, gaining confidence, etc. Who knows where this may lead in a few years?